For the past few years, my hair regimen has been moved around and changed so much that I couldn't tell you when I last purchased a particular product. Within the last year, I have been using Organix hair products and have seen a dramatic difference. 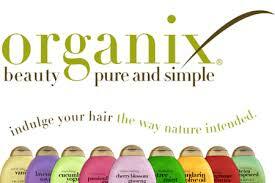 Organix is a company that prides itself on being sulfate, paraben, and gluten free. Not only are their products healthy for your hair, but they give you a whole new look! Okay, so why am I writing this post? Because I want my readers to make educated decisions to maintain a healthy lifestyle. I am currently using the Macadamia Oil shampoo and conditioner and I absolutely love it. My hair is soft, my curls are in tact, and I have an everlasting clean and fresh feeling in my hair. In the past I have used the Brazilian Keratin Therapy line, as well as Biotin & Collagen, and pieces from the Tea Tree Mint and Awapuhi Ginger collection. With all of their products, I have never had anything negative to say about them. Do I think Organix is a good investment? Yes I do. Would I continue to purchase their products? Of course! I am honestly tired of companies advertising that their products are non-drying and are healthy for your hair when not only me, but friends and family have used the same products and had the same outcome. There is no turning back once you begin to use Organix and right now, I am torn between Organix and DevaCurl (which is also amazing). My advice: Purchase the trial kits of the Organix line you'd like to purchase and go from there. One line may not work for everyone, but it's sure worth a try. Happy hair hunting and live healthy and happy! Image was taken from Google Images.